A dark fairy tale about surviving the human experience. 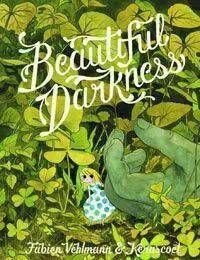 Beautiful Darkness is a harrowing look at the human psyche and the darkness that hides behind the routine politeness and meaningless kindness of civilized society. The sweet faces and bright leaves of Kerascoëts joyful watercolors only serve to highlight the evil that dwells beneath, as characters allow their pettiness, greed, and jealousy to take over. It a bleak allegory on the human condition; Kerascoëts and Fabien Vehlmanns work is a searing condemnation of our vast capacity for evil writ tiny.